Over 1,000 exhibitors from across ASEAN have snapped up more than 460 booths at ATF TRAVEX 2013. This strong exhibitor line-up, which is 40% larger than the previous ATF TRAVEX showcase, represents a wide range of diverse products and services from the 10 ASEAN countries. The exhibition boasts 75 corporate booths, the highest number achieved by the event thus far. With new exhibitors comprising 35% this year, and strong booth take-up from returning exhibitors, ATF TRAVEX consolidates its position as the leading travel trade event showcasing the largest contingent of ASEAN destinations, products and services. Host country Laos participates with its largest ever contingent at ATF and aims to meet and create relationships with buyers and the international and regional media. The host committee is excited at the amount of exposure the event has garnered thus far, and expects publicity to continue escalating in the lead-up towards ATF. International media registrations have also hit the 170 mark. The show’s coveted hosted buyer programme attracted close to 1,100 registrations, of which only some 380 quality buyers will be selected for hosting at the event. In addition, more than 50 buyers will attend as non-hosted buyers. Through focused efforts over the past year, the TRAVEX Secretariat has attracted buyers from new countries such as Argentina, Austria, Bangladesh, Ireland, Israel, Laos, Nepal, Pakistan, Saudi Arabia, Slovenia, Sri Lanka and Taiwan. In all, 57% of buyers are expected to be new at this year’s event. The host committee has crafted tours to give delegates an authentic experience of Vientiane and other popular destinations in Laos. Three city tours around Vientiane and Buddha Park will give visitors an insight into the history of the capital city. The post-show tours will take delegates on 3 Days - 2 Nights trips to two of the most celebrated and beautiful locations in the country, Luang Prabang and Pakse/ Khong. Registrations to the tours are filling fast as delegates sign up in large numbers. In keeping with the ASEAN region’s consistent efforts to promote sustainable tourism, the theme for ATC 2013 is ‘Road Map for ASEAN: Fostering Sustainable Growth, Promoting Eco Tourism.’ The keynote address will be delivered by PATA Foundation Chairman, Mr. Mario Hardy, who has been an active member of PATA since 2009. PATA Foundation’s mission is to contribute to the sustainable and responsible development of travel and tourism in Asia Pacific through the protection of the environment, the conservation of heritage and support for education. 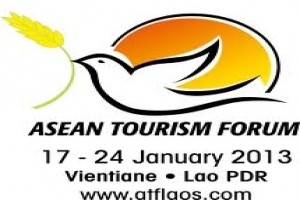 ASEAN Tourism Forum (ATF) is a cooperative regional effort to promote the Association of Southeast Asian Nations (ASEAN) region as one tourist destination. ATF TRAVEX is the longest-running annual ASEAN leisure travel trade event, showcasing the largest contingent of ASEAN sellers. This annual event involves all the tourism industry sectors of the 10 ASEAN member nations: Brunei Darussalam, Cambodia, Indonesia, Lao PDR, Malaysia, Myanmar, Philippines, Singapore, Thailand and Vietnam. 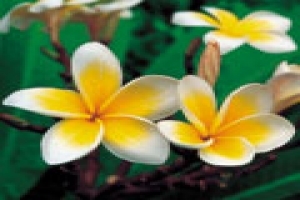 Each year the hosting of ATF is rotated among the member countries. 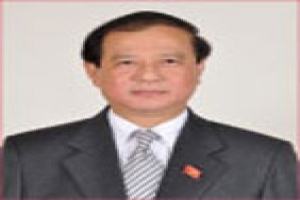 Lao PDR will host ATF 2013 and is all geared up to welcome over 1,500 delegates which includes more than 400 international buyers and 100 international media. 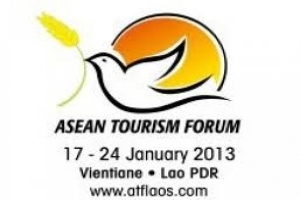 ATF 2013 marks the 32nd anniversary of this event since its inauguration in Malaysia in 1981.